Helping you connect to your power to communicate, create and come alive! My father recently passed away, and although there are many profound aspects to this experience, the one I want to share today is one of impact. I was filled with love as people reached out to me in all sorts of ways to share the impact my father had on their lives. And the stories kept piling in. While anyone that knows me well, knows that my love and devotion to my father already ran deep, hearing these stories opened me up to a deeper appreciation and love for the way in which my father had lived his life and lifted others. I knew how much I loved and respected my father, but I honestly had no idea how many fond memories filled with love and respect that others held of him too. This got me thinking. A lot. What if I had heard these stories even before my father passed away? What would be the impact on how much I was able to love and support my father in his wonderful life? What would it look like if I shared my gratitude and appreciation for the friends and family in my life, with their friends and family? Would my friend’s children see their Mom in a whole new light when I share with them how amazing her timing is for knowing when I need a hug, even when I don’t reach out? Would my cousins have a whole new appreciation for their parents when I share with them what rocks their parents have been for our family over the past few years especially? Would my friend’s husband see his wife in a whole new way when I tell him that her ability to dive into deep play with me in the woods has fulfilled life-long dreams for how much I could laugh with, love and appreciate sister-friends? My whole body flooded with warmth at the thought, and I committed in that moment to sharing impact, not only with the people who have impacted me, but with their loved ones too. I love the idea of living in a world of appreciation and love. Would you join me? Notice what the other person is saying or doing with or for you. Reflect back to them what you heard, or experienced – either in your own words, or paraphrasing. Share how hearing/experiencing that makes you feel, and how it has affected you. I invite you to think of three examples of people or experiences you had in the last 24 hours that had an impact on you and share it with the person who was a part of these experiences. Bonus points if you want to take it a step further and share the impact this person has had on you with their loved ones too! Enjoy the feeling of love and appreciation multiplied and be ready to allow it to come back to you as well. p.s. I gave more examples in this video here. You know the saying “If you want something done, ask a busy person to do it.”? And how many times do you hear “I’m so busy” come out of someone’s mouth when you make a request or ask for a favour? It’s like the North American status symbol these days to be able to prove how busy you are by listing off all the things you are doing. A hamster on his wheel is pretty darned busy too. And most of us are a lot more like the hamster than we may be willing to admit to ourselves right now. 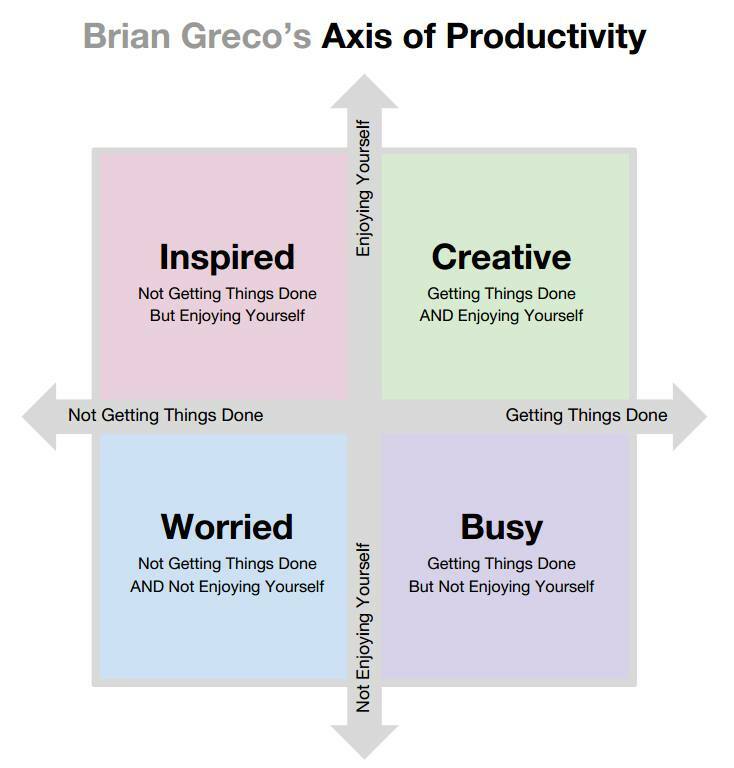 When you see Brian Greco’s Axis of Productivity below, where would you say you spend most of your day? Where would you say you want to be spending most of your day? I heard Darren Hardy speak recently and the following story really hit home to me like a slap in the face. When he was a young, go-getter, full of ambition real-estate agent, he sat down to figure out what his top 3 money making activities to bring in the most return on effort. So he bought a big hang-around-your-neck stop watch and meticulously tracked every minute of his day with how he truly spent his time in his real-estate business. I think on his first day he was in shock when he tallied up his activities and times and was hit by the realization that he had spent less than 17 minutes of his day doing the top 3 activities that he knew brought in business. If I recall correctly it took him weeks (if not longer) and a lot of discipline to get close to 4 hours in one day of time spent where he actually wanted it to be spent. I have recently been having conversations with some very successful entrepreneurs and starting to realize that if I timed myself throughout the day, I’d be lucky if I too made it to 17 minutes. And that is IF I spent some time to focus on what my top 3 activities are towards which precise goal I am measuring myself against. Because like it or not, we are all measuring ourselves to some extent or another. So better to be honest with myself and call it like it is, rather than stuff down the emotions of wanting to do and have more than I currently am doing and having. I know it is possible. I know it is inevitable. I am now realistically writing out what the steps are between here and there and consistently taken action. And I have found a group of people who will hold me accountable, because let’s face it, I accept my own excuses all the time for not doing things, and most of the people who know and love me also accept my excuses. So finding people who know and love you and will hold you accountable to keeping your word, and also mentor you on what the steps are to help you keep your word is VERY POWERFUL. So how can you be in action today that will have you BEing an empowered creator? Categories: Aha moments, Something new to try, This worked for me | Tags: being in action, perspectives on power, power of action, productivity | Permalink. So I ran a 5KM last weekend with my niece and it went really well except I did get a really huge blister on my instep during the race and it is still healing. Despite that, I went for my first ever aerial silks training class yesterday. I’d like to say I have Cirque du Soleil potential, but the fact is, I have a long road to go to get there! Lucky for me that is not my dream! My dream is to be in the best shape of my adult life and this year has been full of that kinda stuff! So I’m used to doing mountain climbers and planks of all kinds and loads of other ab exercises in the hot yoga classes and this 30*30 total transformation home exercise routine I started. Who knew that doing those things part-time and sitting at a chair in front of a computer full time would mean that pulling oneself up into the silks like a chin up and then raising ones knees to their chest would require a whole new level of strength?!!! Watching the instructor perform the above move at the very beginning of class, well, she made it look really easy! 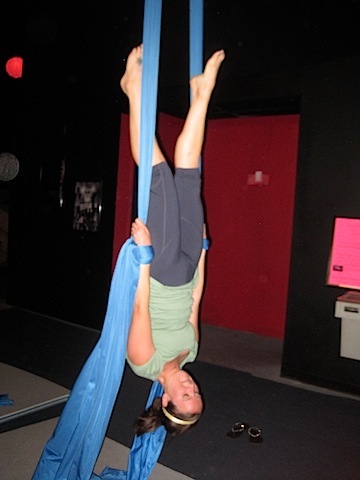 Then a few people who had been taking aerial silk classes for a while also made it look really easy. And none of these people were particularly ‘cut’ or ‘ripped’. To me they looked like your average fit person. But when I attempted to do even a tiny fraction of what they were capable of doing on the silks I was humbled. Lucky for me I find this inspiring. I love knowing that next week when I go back I will have built up even more strength and I will see vast improvement over the 6 weeks. I love knowing that building even more strength than what I already have will help me to feel powerful and strong, physically and emotionally and mentally. I love that I won’t look like I’m in the WWA just by building some strength. I love that I will be more ready than ever before for tank top season! I love that I will be able to play and have fun in the aerial silks and eventually do more tricks and perhaps a bit of a routine. I love that I can be humbled and inspired all in one night! What kind of physical strength do you have? Have you attempted an activity lately where you noticed what level you were at? Does the power of physical strength serve you well right now? Are there ways in which building your strength could serve you even more? Whatever it is you do to take care of your body, may the power of strength be with you! p.s. If you’ve ever trained on aerial silks, I’d love to hear some great at-home exercises/frequency to help me build up my silk muscles! I know push-ups and tricep dips and planks are staples. Can they be done daily? Categories: Aha moments, Something new to try | Tags: aerial silks, fitness, perspectives on power, strength | Permalink. I remember writing about my cats as companions and the power pets bring to our lives. 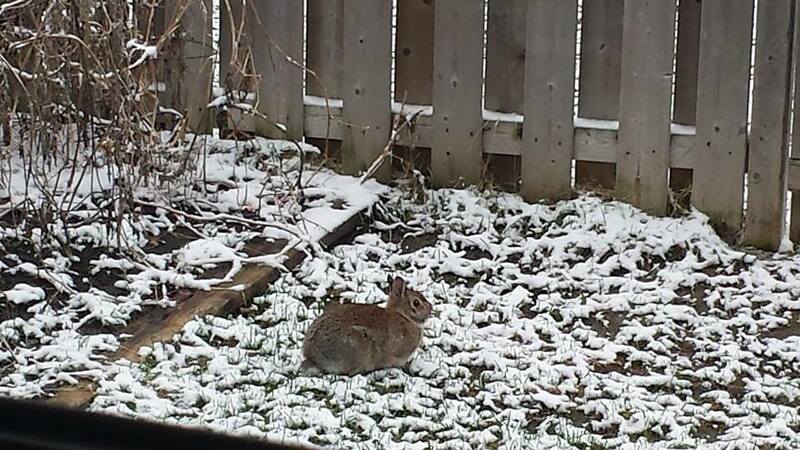 Today I was pleasantly reminded of the power of ‘wild’ animals as well, when I discovered a bunny rabbit in my backyard – he’s a few days early if Easter is his game! Nature is constantly evolving and weaving a magical tale of synergy and love all around us. We are blessed if we but only take a moment to interact. There is great power in BEing with animals – tamed or untamed, live, or through a window/glass/fence/television screen/earbuds. But don’t take my word for it. Test it out for yourself – like a science experiment. Take an incident that happened in the last day or few days that really peeved you right off. I mean you were snappin’ angry at someone for what they said/did. Rate the power of that emotion on a scale of 1-10. 10 being you are no where near forgiveness and 1 being, eck no biggie it was what it was and now it’s done! Ok, now either go outside and close your eyes and listen for the birds singing, or youtube cutest baby animals taking a bath, or baby mala the monkey, or if possible go for a walk in nature and observe all the living creatures around you! Now think about that incident and give the emotion a rating of 1-10 while fully taking in the sounds/sights of any animal. Report back here – did you feel any difference? How long did you spend with the animals? Categories: Aha moments, Something new to try | Tags: animals, bunny, experiment, nature walk, perspectives on power | Permalink. I ran a 5KM race with my niece yesterday. No training. Haven’t run since last September. I survived, but I certainly didn’t thrive. I was super grateful for my niece’s patience and loyalty to run with me the whole time despite the fact she was capable of running much faster and finishing much earlier! While running and I are not the best of friends, I have learned so much from my short foray into the sport (I took a clinic for the first time a year ago and learned how to run properly as an adult and then ran four 5KM races last year). Yesterday I was reminded of one of the most profound lessons I have learned about myself. Before the lesson, you gotta hear the hilarious way in which it was learned! So I was signed up to run in the September 2013 Army Run. By myself. I was super excited for the dog tags that were the ‘medals’. How cool is that?! I was LATE getting to the race. Like pushing my way through the crowd at the starting gate and hopping the fence to be in with the runners near the starting line with less than 90 seconds until the gun went off kinda late. And I am not an experienced runner, so I just assumed I needed to get in that starting pen with the 5,000 other 5KM runners before the gun went off. What dawned on my as soon as my feet hit the ground and just before the gun went off was – Oh $hit, these people are at the front and looking mighty fit! They are going to run this in 20 minutes. I’m more at the 35 minute pace for a 5KM! I tried to push my way back to avoid getting trampled but I got met with angry stares and since we were all crammed in like sardines anyways, it was futile. With less than 30 seconds to go, I had little choice at this point! The gun goes off! The race begins. The first 500 metres is pure uphill. I’m running with the leaders and thinking, wow, this is not so bad! Maybe I will keep up for a while and set a new personal best?! About a kilometre into it I’ve been passed by quite a few, but I’m also keeping pace with quite a few fast people and definitely running at a personal best. That is when it dawns on me! I was afraid to get trampled and look bad, so I found it within me to pick up my pace and at least keep up respectably so. I was also inspired not by people competing or challenging me (I have a strong negative reaction to people insinuating that I am doing something ‘wrong’ and if I just did it their way, I would somehow be ‘right’.) but rather I was thoroughly inspired to action by being in the company of people who had set a higher standard for themselves than I had previously thought possible for myself. I ran almost 3km at a personal best and then *insert excuse here* I started to slow way down back to my pace from before. But somehow I don’t think that race was about setting a personal best. I don’t think it was even about running. I will never ever forget that lesson. What a profound moment to realize what will fuel my own motivation to grow, play, expand and evolve. I won’t thrive in an environment of challenges, or judgments, or comparisons. 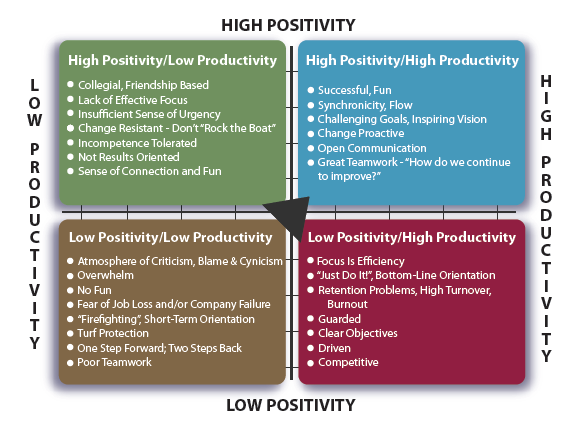 No, when I am trying out something new, or playing in fields that I know relatively little about, I am going to be at my best when I position myself in the company of people who have set high standards for themselves. People who’s idea of normal pace is leaps and bounds above what I thought was possible! The power of positioning! How are you motivated? What inspires you into action? How can you use the answers to those two questions to see some results in an area of life that is important to you? Around whom, around what, and/or where can you position yourself? 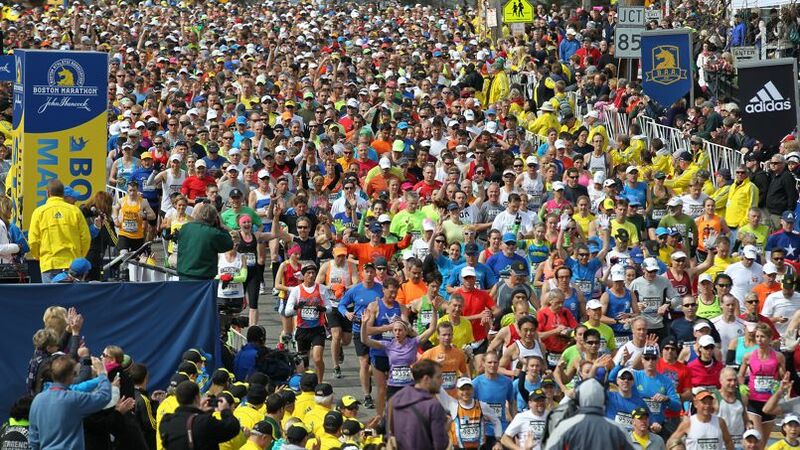 Categories: Aha moments, This worked for me | Tags: 5KM, Motivation, perspectives on power, power, races, running | Permalink. For me the mere mention of family elicits strong emotions and a sense of groundedness and eternal support and love. I grew up on the family farm, surrounded by siblings and cousins and even the surrounding communities where we played cards, went to church, went to school, and got groceries from felt like an extended family. I am home to the family farm this weekend. Back on Fairview road watching spring work her magic. Throwing a baseball with my nephew. Sharing a meal with Mom and Dad (seriously no one’s apple crisp will ever taste like my Mother’s!!) & getting ready to run a 5K race tomorrow with my niece to support the local hospital! The power of family is incredibly fierce. Wars have been waged and great feats of human accomplishment achieved all in the name of family. Consider connecting with your family (either a chosen tribe or the one you were born into or both!) In a powerful way today. Consider opening yourself to share and receive all the gifts that are present and honour one another for who they are as human BEings. Our very presence is such a gift to give, as is the presence of family a true gift to receive. Categories: little miracles, This worked for me | Tags: family, perspectives on power, tribes | Permalink. 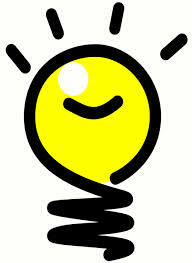 I love ideas! I love knowing that people want to come into conversation with me because they know they will walk away with a tonne of ideas! I love sharing ideas, I love receiving ideas. I love the momentum that idea generation resides in, and I love the energy and enthusiasm that builds with seeing those ideas through to implementation! It may be years in the making, it may only be a matter of hours from idea to completion, whatever it is, if the idea came to you, and you know in your gut that it is your gift to give to the world, whatever you do, hold on to that idea. Water it. And one day you will see it in full bloom. Often I meet people who wonder what their purpose is in life, and I always ask them if they ever had any crazy ideas growing up. And most of the time they did have some dream that age helped them find reasons to not pursue (usually related to time, money, and whether or not others would approve/like/use it). I include myself in this group of people believe it or not. Except now I am changing that perception of me. Now I am declaring myself the birth-mother of ideas, and I am nurturing them into implementation, and I am connected to the power of those ideas as a gift to me and through me. I feel a sense of duty, obligation, joy, sharing, and connection to bring these ideas to life and out into the world. I have a clear vision of how others will be bathed in beautiful vibrations in the sharing of their gifts as well. Sometimes, all we need is a nudge. Sometimes, we need a stick. Sometimes, we need an accountability partner. A coach, a mentor, a friend. Someone who sees our greatness and will not let us give up or give excuses or reasons for why we did not pursue our ideas. What ideas have you had in the past that you did pursue? How did you feel in the pursuing of them? What ideas are still lurking? Do you see the power those ideas have in your life still? Do you see any power in bringing them forward now and pursuing them? I benefit greatly from some amazing accountability partners in my life and I am humbled to serve as an accountability partner for others as well. May you find what you are seeking in your journey as well. Categories: Aha moments, Something new to try | Tags: accountability partner, coach, ideas, perspectives on power | Permalink.